Reminder – Deadline to vote is October 14. 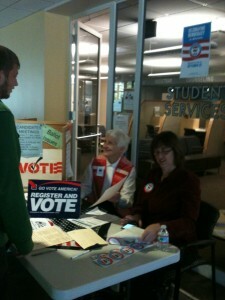 LWV Huntington members registering students at Mountwest Community College. LWV Wood County consensus meeting on Library Funding September 22, 2014 at 5:30 p.m. at Vienna Public Library. See details in September Voter. The Huntington League invites the public to a meeting on Funding Libraries in WV. We have the good fortune this fall to participate in the State Study on Public Funding of Libraries in West Virginia on Wednesday, September 17. We will gather for refreshments at 7:00 p.m. at the Suncrest United Methodist Church, lower level classroom, for refreshments and time to catch up with one another after our summer break. But we will then quickly begin our important task, with presentations from the Library Study Committee members who have been reading the study materials in detail. The consensus itself follows the questions developed by the State League. We hope that in studying this issue we can reach a position to enable us to lobby the Legislature as it develops its legislation on library funding. Only members of the League can participate in the consensus itself, but guests are welcome to come and socialize, and listen to the presentations. Study and consensus are at the core of the League decision making process, and we encourage every member to make an effort to attend. Consensus meetings are lively and never boring! Parking is plentiful at the church (479 Van Voorhis Road), and there is an elevator to the lower level. If you would like background information on the study, the West Virginia LWV has recently published a new 9-page booklet, titled: “A Study of Public Library Financing in West Virginia.” The booklet offers an explanation of the current laws and rules which govern the funding of the state’s 97 public library systems. The Annual Meeting began for League Members and the many guests with refreshments provided by League Members. President Jonathan Rosenbaum began the meeting by introducing the new “Democracy in Action” Awards. Jonathan introduced the first award, to Christiaan Abildso, for his citizen work efforts for public safety, and presented a framed certificate. Kitty Lozier introduced the second award, which went to the Dominion Post for their efforts over many years in voter information. Randy Vealey, Opinion Page Editor, received the award for the newspaper. Lyndell Millecchia introduced the third award, to League member Nancy Treat, for long work in voter’s service and in planning and zoning. Linda Yoder introduced the speaker of the evening, playwright, journalist, and columnist Sean O’Leary of Harper’s Ferry. 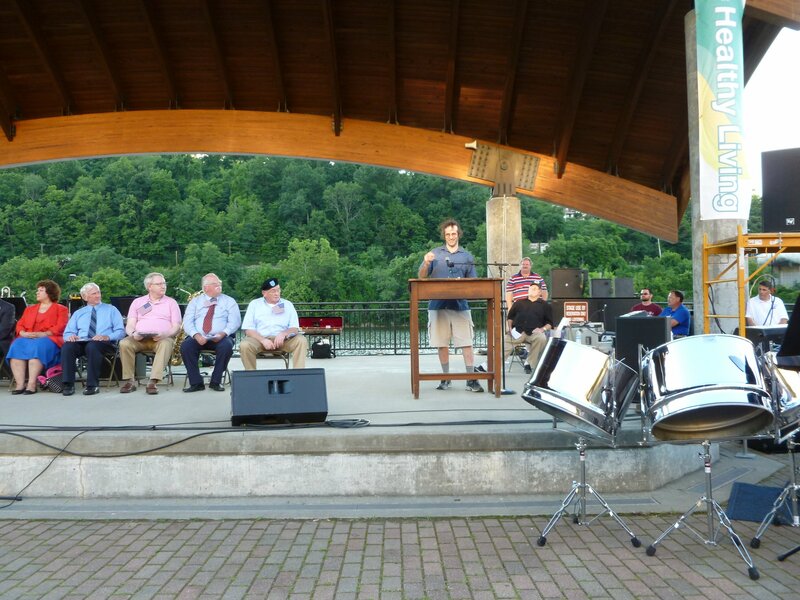 Sean addressed the audience on the topic “Words Unhinged from Facts: The Decline of Public Discourse in West Virginia.” He fielded many questions during his stimulating presentation. The video of his speech is now online for viewing. After a break for more refreshments, the business meeting was held, with adoption of the budget and program for 2014-15, and election of new board members. Continuing Board Members (elected in 2013) are Jonathan Rosenbaum, President; Gloria Sofranko, 1st Vice President; Kelly Palmer, Director; and Shirley Rosenbaum, Director. Lyndell Millecchia was appointed as a Director. If you would like to help with the Candidate Forums to be held in October, please contact Voters Service chair Catherine Lozier at clozier@gmail.com or call her at 304-599-8233. 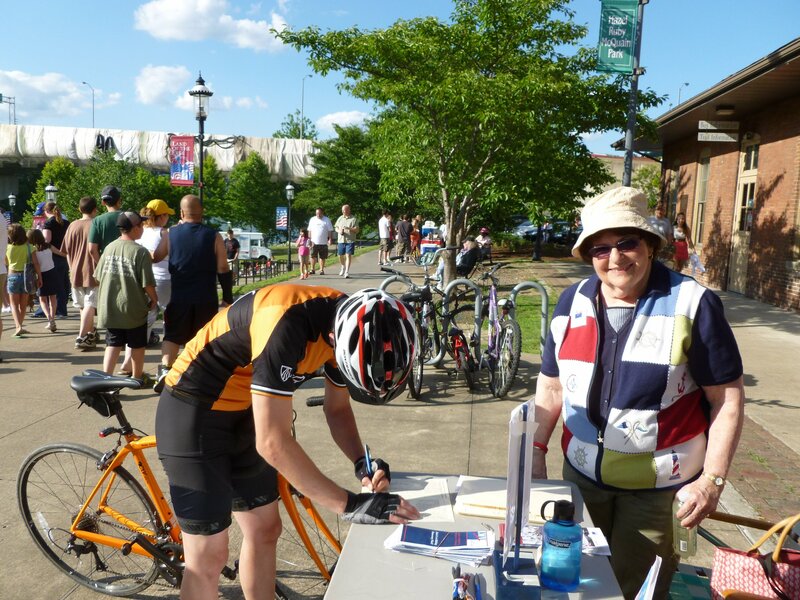 On Tuesday, September 23, the local League will have an information table at the Farmers Market in Westover from 4:00 – 7:00 p.m. We will inform people about the League and in conjunction with National Voter Registration Day, we will have voter registration forms available. Contact Board member Shirley Rosenbaum or call her at 304-599-2370 if you would like to help. 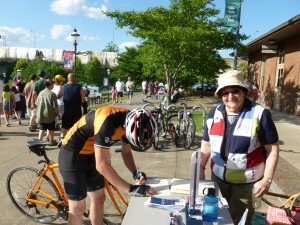 Congratulations to Positive Spin for receiving the Volunteer of the Year Award at the Celebration of America on July 4. Jonathan Rosenbaum, president of Positive Spin, accepted the award on behalf of Positive Spin. The League has a strong public policy position supporting energy-efficiency. Recently Downstream Strategies released the results of their Green House Gas Inventory study, and as a result they have developed the Morgantown Residential Energy Consumption and Efficiency Survey to help identify and quantify specific energy efficiency needs and improvement opportunities across different Morgantown neighborhoods. Ultimately, their aim is to promote the most cost-effective energy efficiency programs and increase awareness of cost-saving energy consumption and efficiency practices. Please participate with their survey at https://www.surveymonkey.com/s/MorgantownEnergy , and spread the word to other people you know living within Morgantown City limits. 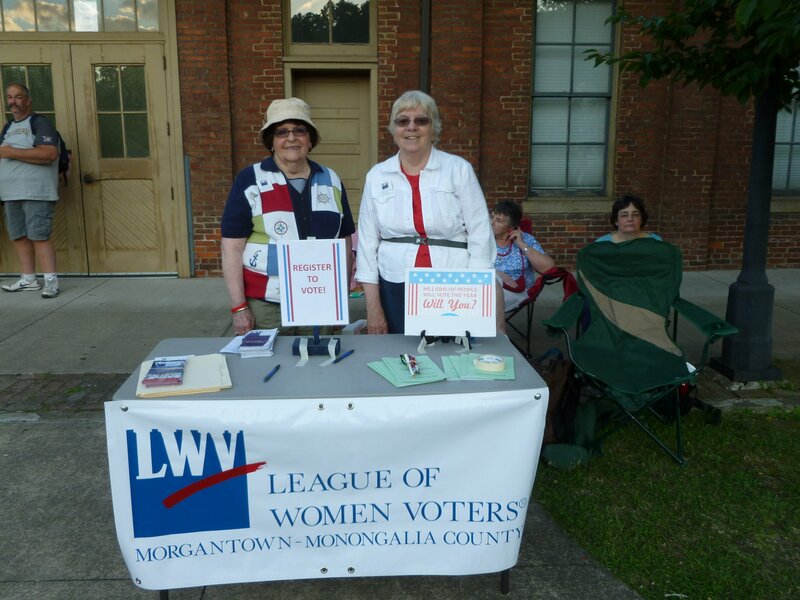 The updated League of Women Voters of Morgantown-Monongalia Guide to Government Officials, July 2014 is now available online. You can also pay with your credit card at http://tinyurl.com/paylwvmm or you may send money from your PayPal account to mmtreasury@lwvwv.org. We will be having two Candidate Forums in October – Details will be in our next Newsletter!